Nabholz Construction of Rogers is using a building permit valued at $7.67 million for a 7.9-acre commercial project at 309 N.E. J St. in Bentonville. The project developer is Bentonville Child Care & Development Center, and the 43,700-square-foot building is for the nonprofit Helen R. Walton Children’s Enrichment Center and Early Childhood Initiatives Center. LTL Architects of New York is the designer. SCAPE Landscape Architecture of New York is the landscape architect. New York-based Silman is the structural engineer. Harrison French and Associates of Bentonville is the mechanical and civil engineer. Lumen Architecture of New York is handling the lighting design. Hight Jackson Associates of Rogers is the architectural consultant. The site is just south of the entrance to the Crystal Bridges Museum of American Art. The building will include 35,000 square feet for the HWCEC, and 8,700 square feet for the ECIC, a sister company that was opened in 2009 to support the 507 early childhood programs that provide care and education to more than 40,000 children in Northwest Arkansas. The HWCEC — founded in 1982 and renamed in 1985 — announced plans for the new Bentonville facility in 2015. Both centers are now housed in a 32,000 square-foot building on Northeast Wildcat Way, behind Washington Junior High in Bentonville. The project is part of Walton Family Foundation’s Northwest Arkansas Design Excellence program, a pilot project with the goal of elevating the quality of architectural and landscape design in Northwest Arkansas. One of Fayetteville’s most visible commercial buildings has changed hands for $3.75 million. 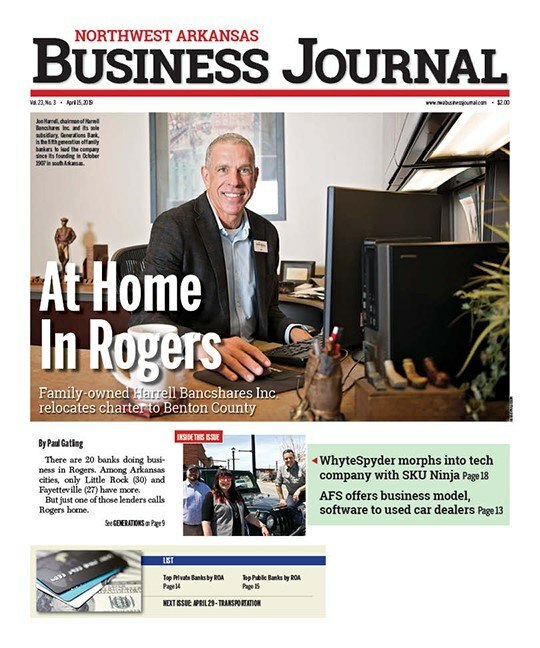 Fayetteville-based home builder Rausch Coleman Homes, through its American Residential Group LLC, acquired the three-story, 41,737-square-foot building just north of the intersection of Joyce Boulevard and College Avenue known as One Corporate Square, at 4058 N. College Ave. The purchase price equals $89.84 per square foot. Danville-based Chambers Bank financed the deal with a 10-year mortgage of $3.18 million. The Class A office building has four tenants, including Rausch Coleman, and is 100% occupied. It had been owned since January 1995 by El Dorado-based Munoco Co., a family-owned company engaged in oil and gas exploration and production, as well as timber, real estate and farming operations. The company has a large portfolio of commercial real estate, farmland and timberland holdings in Arkansas and Louisiana, under an entity called Cherry Ridge LLC. Baldwin & Shell Construction Co. built the building in 1988 for $4 million. The previous owner completed a $250,000 renovation of the property in 2013. Moses Tucker Partners in Fayetteville is the property manager. Land for a planned mixed-use project between Crystal Bridges Museum of American Art and Memorial Park in Bentonville has changed hands in a $3.03 million deal. The purchase price equals $2.50 per square foot. Cindy Pickens LLC, a Delaware-registered entity, now owns the 27.8-acre site on John DeShields Boulevard. Cindy Springs LLC, an entity controlled by Walton Enterprises LLC, the holding company owned by heirs of Walmart Inc. founder Sam Walton, was the seller. Waco Title Co. of Springdale was the title agent. A mixed-use project called Crystal Flats was approved for the site by city planners in December. The first phase includes 487 residential units and 15,000 square feet of commercial space. The University of Arkansas has completed two land acquisitions in south Fayetteville totaling $2.1 million. The school paid $1.6 million for a 12,640-square-foot commercial building at 639 W. Martin Luther King Blvd. RPC Land Holdings LLC, led by Ronald and Polly Connolly, was the seller. The lot size is 0.35 acres. The UA also paid $500,000 for a 1,932-square-foot residence and 3,210-square-foot multifamily property situated on 0.32 acres at 641 and 643 W. Martin Luther King Blvd. Eliot and Jo Ann Kaminsky were the sellers. City Title & Closing LLC of Fayetteville was the title agent in both deals. All structures will be razed and removed and the property will be used for the expansion of the UA’s Art and Design District facilities and grounds. Residential lots in a recently platted neighborhood in east Rogers changed hands for $1.46 million. Fox Briar Investments LLC, registered to Fayetteville attorney Allissa Sims, acquired the 10.51-acre parcel northeast of the intersection of East New Hope and Monte Ne roads. The site, Phase II of the Fox Briar subdivision, contains 48 buildable lots. JDH Holdings LLC, led by James Hayes and Jerry Hawkins, was the seller. First Western Bank in Rogers provided financing with a two-year loan of $871,644. Waco Title Co. of Springdale was the title agent. A 2.46-acre hillside lodge on Beaver Lake has a new owner after a recent sale worth $1.25 million. In an all-cash deal, Pat and Clare Reed bought the 4,455-square-foot residence on Coose Hollow Lane. Jeff and Dawn Scroggins were the sellers. City Title & Closing of Fayetteville was the title agent. Jan Holland with Coldwell Banker Harris McHaney Faucette in Bentonville was the listing agent. The three-story home comes with approximately 1,200 square feet of wraparound deck space and four-stall boat dock. Scroggins bought the property in January 2009 for $925,000. Joshua and Kristin Copher were the sellers. In two separate deals, Orchard Properties of Fayetteville has acquired 153.5 acres of agri land in Tontitown west of Arkansas Highway 112 for a combined $1.54 million. Orchard, through its Dowell Road LLC, paid $1 million for 113.5 acres on Dowell Road, south of Highway 412. The purchase price equals $8,810 per acre and $0.20 per square foot. The Robert Eugene Burge Irrevocable Trust was the seller. Waco Title Co. of Springdale was the title agent. To the north, west of South Klenc Road, Orchard used its Wildcat Blvd LLC to acquire 40 acres for $540,000. CPSA Tontitown LLC, led by Delbert A. Allen Jr., was the seller. City Title & Closing LLC of Fayetteville was the title agent. A 12.58-acre residential property in east Fayetteville’s Autumn View subdivision came off the market in an $855,000 sale. The Steve Wood Irrevocable Trust bought the 4,745-square-foot residence on Autumn View Drive. Dustin and Mia Stanley were the sellers. Waco Title Co. was the title agent. The Taylor Team with Keller Williams Market Pro Realty in Fayetteville was the listing agent. The three-story home was built in 2015. Stanley bought the land in 2013 for $130,000. Jesse and Kristin Gray were the sellers. Submit tips about lease activity, construction, transactions or upcoming projects valued at $300,000 or more to Paul Gatling at pgatling@nwabj.com. Please write ‘Real Deals’ in the subject line.